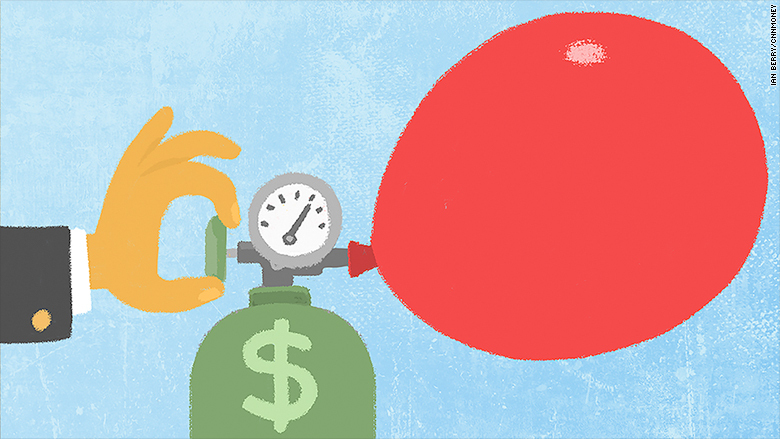 Who will get hurt if the startup bubble bursts? The possible bubble brewing in the startup market could pop faster than you can say "Snapchat." When and if that happens, real people will be hurt. The good news is that the impact on the economy as a whole would probably be far smaller than the dot-com bubble that popped in March of 2000. That mania hurt millions of Americans who had invested in tech companies like Pets.com that went bust shortly after going public. Few of today's hot startups have sold any shares to the public at large because they aren't listed on a stock exchange yet. The people who will lose the most are startup founders and employees. Their get-rich dreams will go up in the dust if their stock options are worthless. That will have ripple effects in Silicon Valley and beyond. "The founders and employees could be left with no money left for them," said Michael Dempsey, a research analyst at CB Insights. Big money: For now, it's an incredible time to work at a startup. Just look at the growing roster of "Unicorn" companies, the industry's term for coveted startups that have achieved a price tag of $1 billion and above. There are now 116 Unicorns with a cumulative valuation of $439 billion, according to CB Insights. Well-known Unicorns include Airbnb, Snapchat, Uber and Pinterest. Those four young companies are worth a combined $93 billion. To put that in context, that's roughly the same combined valuation of far more established technology companies like LinkedIn (LNKD), Twitter (TWTR), Yahoo (YHOO) and GoPro (GPRO). Related: If not startups, where is the next bubble? Bonds? Real estate? Crash would cause carnage: The mad rush to find the next class of Unicorns is raising fears that there is a bubble. Can prices really be justified by the underlying fundamentals? "It seems pretty clear there is froth -- if not excess," said Scott Kessler, head of technology sector equity research at S&P Capital IQ. "We're seeing companies that from what I can tell are worth billions of dollars and have little business models or revenues to speak of." If there is a bubble -- and there's no guarantee there is -- the ensuing crash will cause damage. "When valuations inevitably compress for technology companies, the significant majority of them will still be private, and thus public mom and pop investors will not be impacted as much," said William Hsu, co-founder of Mucker Capital, an early-stage venture capital firm. Some retail investors may take a tiny hit because they own mutual funds that are invested in startups. However, these investments typically represent a very small percent of the total fund. Employees, founders would hurt the most: Far more pain will be felt by startup founders and employees, who would lose their jobs and, possibly, their small fortunes. Just ask Lane Becker, who co-founded a $50 million online customer-service startup called Get Satisfaction. Earlier this year he was forced to sell the company in a fire sale that left Becker, many employees and early investors without a dime. "The founders were washed out of the deal. We got nothing," Becker tweeted at the time. That can happen when struggling startups are forced to sell themselves for less money than they raised from venture capitalists. Fundraising deals give VC firms liquidation preferences that allow the investors to recover at least the money they invested -- before anyone else -- no matter the sale price. It's a way for VC firms to hedge their risk. That means employees lured away from more stable companies by the promise of stock options could be left empty-handed. "Some of these liquidation preferences are going to absolutely kill employees and founders," said Dempsey. Because of the way the deals are structured, VC firms may not get too slammed by the initial collapse in startups. However, eventually capital would dry up, causing struggling VC firms to go out of business and limiting the ability of startups to receive new funding. Startup ecosystem threatened: Other likely losers in a startup bust include those in the ecosystem that has been fueled by the tech boom. That means office management, human resources and other companies whose clients are mostly startups. It's easy to see how some restaurants in Silicon Valley would also be hurt. And then there's the real estate market, where prices have soared due to strong demand from startup companies and their well-paid employees. "There is this house of cards effect," said Dempsey. Ironically, the winners in a startup bust could be former startups who have made it. More mature tech companies that have already gone public like Facebook (FB) and Google (GOOGL) would see potential competitors get wiped out. It would also be a great time to pick up innovative companies and employees on the cheap.